Spelling your racehorse is one of the most important aspects of owning a performance thoroughbred. As with any athlete that have been in intensive training and then performing at the highest level of their ability, rest and recovery is vital to ensure that that your horse will be ready for his next race preparation. 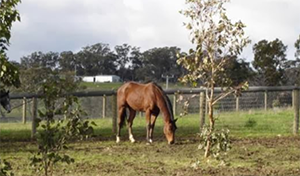 Victoria has a vast array of high quality Agistment farms run by experience horse people who understand what a horse needs during its recovery period, many of them also offer specialist facilities for sick and injured horses as well. TBV recommend you contact a farm that will allow you to visit your horse and ask about the services they provide and the experience of the farm manager so that you can have a thorough understanding that your horse is being fed and handled appropriately. For information on Agistment Acts & Contracts please download the pdf’s below. The following downloads are Copyright © State of Victoria Department of Environment and Primary Industries 2014.